In the aftermath of 9/11 terrorist attacks, psychologist Dr. Judy Kuriansky and composer Russell Daisey wrote a song to help with the healing process. A decade later, that song is helping in the recovery of another horrific disaster. 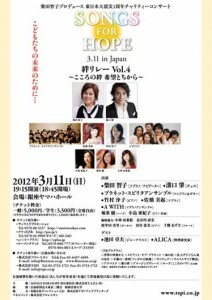 The song, “Towers of Light,” was translated into Japanese by opera singer Tomoko Shibata, who will perform it at Yamaha Hall in Tokyo on Sunday, March 11, the one-year anniversary of the 9.0-magnitude earthquake that triggered a massive tsunami and damaged the Fukushima Daiichi Nuclear Power Plant. Kuriansky (known as Dr. Judy) and Daisey will travel to Tokyo as special guests of Shibata for the premiere performance of their song in Japanese at the Songs for Hope Memorial Concert. 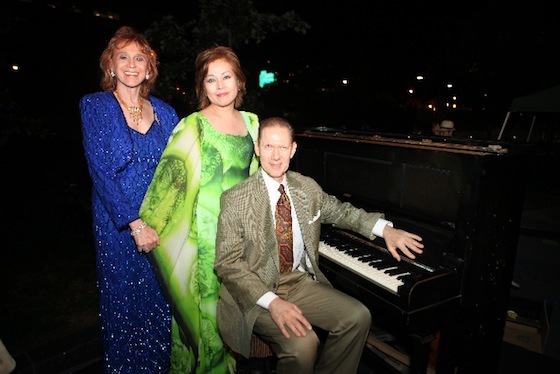 Shibata first sang the “Towers of Light” anthem with Dr. Judy and Daisey in September 2010 for the highly acclaimed series of piano concerts for Hiroshima Hibakusha (survivors of the atomic bombings during World War II) in New York City. Shibata also sang the song for the tenth anniversary of 9/11 at the 9/11 World Trade Center Memorial Floating Lantern Ceremony on the Hudson River. After performing “Towers of Light” in the trio over the last few years, Shibata translated it into Japanese as “Souls Become Stars.” Given their shared vision, this endeavor for peace has expanded and transcended the song’s initial inspiration to encompass a connection between the two monumental tragedies of 9/11 and 3/11, as well as fostering healing for survivors of both catastrophes. Dr. Judy and Daisy are the co-founders of the Stand Up for Peace Project (SUFPP), an initiative that promotes peace, understanding, and healing worldwide. They have performed “Towers of Light” internationally at peace festivals, United Nations conferences, Global Harmony concerts, peace seminars, and music and peace tours throughout Japan, Mexico, and Haiti, as well as at the First Hiroshima International Peace Summit in Hiroshima, Japan, for Nobel Peace Laureates the Dalai Lama and Betty Williams. Daisey is an internationally acclaimed pianist/singer/songwriter who has played command performances for American presidents and world dignitaries, including Bill Clinton and George H.W. Bush, Secretary of State Hillary Clinton, Vice President Al Gore, former Canadian Prime Minister Brian Mulroney, and the Chiniya Lama of Kathmandu, Nepal. “I passionately believe that music gives hope and lifts spirits of people in trauma,” says Shibata. The fear of another quake is ever-present in Japan, she explains, and people around the world also experience trauma and need comfort. Next Next post: The Dreamlike – and Beautiful – "Jiro Dreams of Sushi"